Hi friends! I was in Paris not too long ago and got to meet and tour the creative workshop and retail space of French designer and author . Do you know of her? I've been following Adeline's work for many years when I first found out about her through former cattledogs columnist . So when my assistant lined up a special morning with this lovely lady, I was thrilled! She had me and my friend come to her shop for a special - to create crepe paper flowers, and talk to her a little about her business. 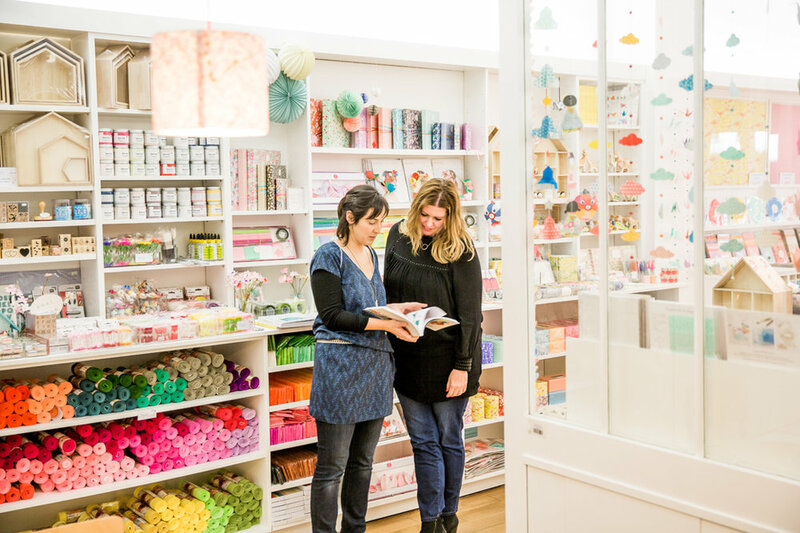 Located in Paris, Adeline's shop is what you'd called a playland for crafty adults and children, too. She sells lots of for makers that include all of the ingredients to make the featured craft on the kit cover. The one thing I associate the most closely with Adeline is . She sources only the best from Japan, some coming from very traditional paper factories there, and it's stunning! In fact, she infuses her many projects and products with it - there are so many applications for this type of paper that goes beyond origami craft. Adeline studied textile design in Paris and now applies her love of pattern to her work as a shop owner, craft creator, product developer and book author. Adeline showing me one of her books. It was so nice to get an overview of her work and be in her environment. Her work is such an authentic expression of who she really is at her core and I appreciate that immensely. True to self - there is no better way to live! I loved seeing the wooden animals; my son collects these as they are from Germany. She also had many other German products in her French shop which made me proud. I love France, but Germany also has some amazing craft products, toys, and beautiful interiors objects. It was so nice to take a custom workshop with Adeline. I could seriously do this once a month if I lived in Paris. We made paper flowers with the prettiest centers and delicate stems. I ended up taking all that we made home with me and used them to decorate my son's party. This is her shop from the front looking in. To the far left in the back is where she teaches as a large wooden table. Straight ahead in the back is a long space where I saw lots of desks and some of her staff working on the computer. Seemed like she has quite a bit of work to do and that in this studio, they are always very busy yet the spirit was gentle, calm and very chilled out. We were busy making flowers. Adeline liked having a man in her studio, she said it's rare to welcome men to make flowers there! Funny enough, my friend felt comfortable and made flowers that turned out prettier than my own! I was happy to see this, because I love watching people regardless of gender, make things, especially seeing men craft flowers - it shows that one is comfortable in their own skin to do what others may call typically "male" or typically "female". Adeline was so pleased having him there though, she was patient with us both and wrapped out blooms in a sweet little white gift box when we left. It felt so special! Also, Adeline also had plenty of pom poms and honeycomb balls in stock along with beautiful Japanese fabrics which were sold by the meter or pre-cut in kits. 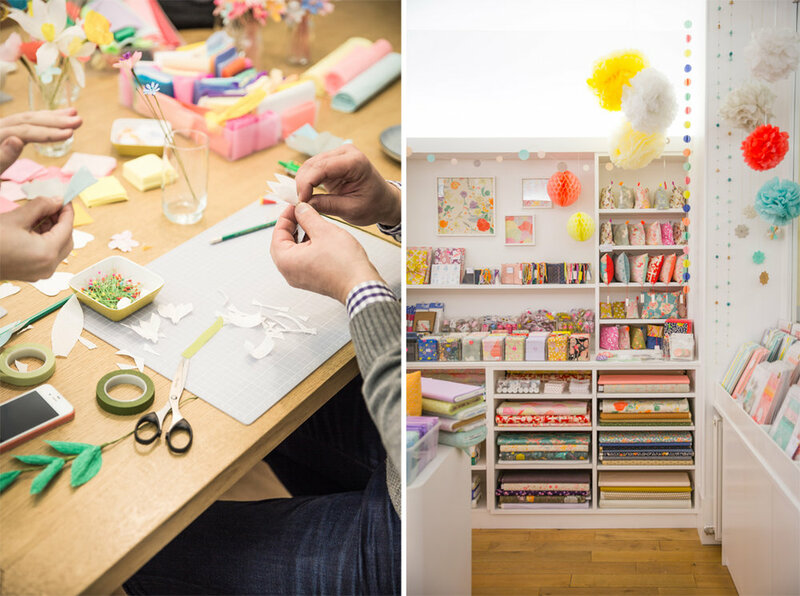 I loved the strands of origami dolls and cranes hanging around the shop. They looked so pretty! It made the shop feel festive. These are the flowers we made, the ones that look nicer than others are most likely the ones that she made. I wasn't nearly as good at paper flower making as I used to be when my mother made them with me as a child. I am rusty! I need to practice more often, so I was sure to grab a few flower kits before leaving her shop. A glimpse of just some her kits. Some include everything you need to make a craft. Others just include a selection of papers in a specific palette. I brought home a few different kits to explore my own creativity when I have time. See the lovely cranes? These were tied to a wooden mobile. It gave me some ideas for my son's room. Lighting is a big offering at her shop. Lighting that is wall mountable and pendants. Aren't they so lovely? More great pendants in Japanese patterns. This one was very pretty in peach, and the pattern was quiet which I liked. Her shop was such a feast for the eyes. I wish I had been able to spend more time there, but we had arrived late (traffic!) so we lost an hour, which made our visit too short. Next time! I will definitely schedule a larger block of time so I can really look over everything in more detail. Here is a closer view of her nook. Wow, right!? She had some lovely fabrics framed too. I'm a huge fan of Nani Iro so when I saw that she had lots of her prints, I was in heaven. Their painterly motifs range between organic shapes to flowers. You can use them to make clothes or for home craft. As you can see, Adeline also stocks bags and pillows, too. A glimpse of some of her book covers along with more fabrics and kits filled with Japanese papers. I also liked very much seeing origami flowers, horses, cranes and butterflies framed. Another great deco idea too, right? Such fun petite patterns and cheerful colors with every turn. A real sensory explosion. A closer view of the framed origami papers and a nice view of her shelves - washi tapes, tissue box covers, kits, pillows, rolls of crepe paper in a million colors, it was seriously heavenly. Another view of these great wall lights which I can see fitting in perfectly in an artists' workroom or a little girl's bedroom, can't you? Adeline thank you so much for having us in your beautiful store. I hope our visit inspired you as much as we were inspired by all that you do! Thank you for letting us snap some photos while there as well, it was a pleasure! 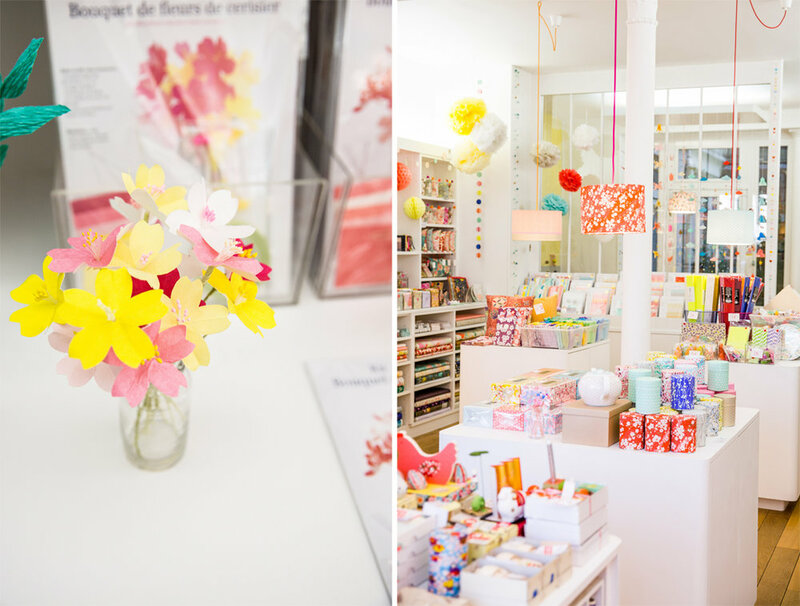 So readers... What do you think of this beautiful shop in Paris? Have you been? Do you want to go now? I bet you do! She has an (and a ) if you are interested in checking out her products.